As they always are, the social justice encounters for Creighton University students on the Fall Service & Justice Trips in October were myriad.There were the realities of poverty, migration, hunger, homelessness. But in West Virginia, there was Bill and Bob and Jim and Crystal. In Nebraska, there was Brian and Kathy and Logan. New Orleans brought Burnell. Montgomery, Alabama is home to Mary Louise. These names and more ushered from the lips of eight Creighton students the morning of Nov. 14 as they shared their experiences as part of a contingent of 238 students on 30 week-long Service & Justice Trips around the nation. The trips exist as an extension of the Jesuit pedagogy at Creighton, giving students a real, lived experience to join to the academic, classroom learning they do daily. In Wheeling, West Virginia, senior Carly Kenney and junior Kurt Sierra experienced life on the margins with people living in a food desert and subsisting on $1.31 per meal through the federal Supplemental Nutrition Assistance Program. As part of their week-long experience living with the House of Hagar Catholic Worker intentional living community and working with the Grow Ohio Valley food justice initiative, students took that $1.31 and tried to eat lunch on it. At a local convenience store, the options for a nutritious meal were limited. During nightly reflections, Sierra said he realized the mission was clear. Giving voice to the voiceless took on new meaning for another set of students in West Virginia. Chris Torres Lopez, a sophomore, was part of an environmental and sustainability immersion trip in the state’s coalmining region. 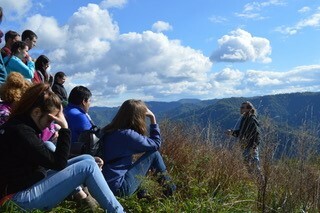 Witnessing the environmental degradation of mountaintop removal, Lopez said he was, like the very rocks, trees, plants and animals around him, mute in the face of such devastation. A packed hall of staff and faculty in lower St. John’s Church lauded the students for their courage in undertaking the trips and in sharing their experiences as a demonstration of the Creighton mission in action. Angela Maynard, assistant director for clinical support in Student Health Services, said she always looks forward to what the SCSJ students share. Being able to take the measure of Creighton’s values out in the real world, the students agreed, was a blessing in itself. On the U.S.-Mexico border in El Paso, Texas, junior Anna Ziola said her group spent the early part of the week familiarizing themselves with the circumstances of undocumented people crossing the border in search of work and refuge.